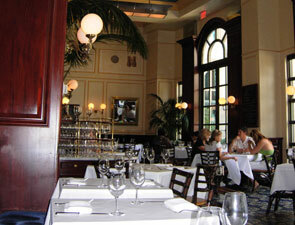 You'll find Bouchon Las Vegas on the pool deck level of the Venezia Tower of the Venetian Hotel Resort and Casino. After taking an elevator there you'll immediately note the grandeur of the hotel's registration area, located on the same level, with domed ceilings, large chandeliers and ornate decorations both overhead and underfoot, on the shiny marbled floors. Large greenery adorns the lobby, from which a long hall stems. Follow that hall and make a left after the shops to find Bouchon. On the right you'll have a view of the outdoor seating of the restaurant and a modest view of the pool deck through the trees outside. 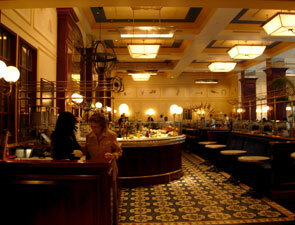 As you approach the restaurant you'll at once note its distinct French feeling. Take, for instance, the domed portion of the hallway. There are red walls lit with traditional French-inspired wall-mounted lighting that's installed on either side of the main doorway, which features French doors made of an inviting dark brown wood, framed by cream-colored molding. The doors feature glass windows and ornate but delicate white fabric that allows you to see inside the restaurant while maintaining privacy for those inside it. Above the entryway, meanwhile, are two plaques that announce, "Thomas Keller's Bouchon, A French Bistro," which make you feel as if you've stepped off the Strip and into Paris. Both doors are ajar while the restaurant is open, eagerly awaiting your arrival. Upon entering Bouchon you'll be struck by the tall ceilings and the floor-to-ceiling windows - French doors, actually - to the right that let you out to the patio. The first thing you actually see, however, is the hostess station, which is located in front of you and slightly to the left, made of the same dark wood as the restaurant's front doors. The tiles directly in front of you have the word "Bouchon" emblazoned on them. There are seating areas to the right, in case you need to wait for a table, that are equipped not only with a television, in case you simply can't miss the nightly news, but also with striking flowers, black- and gold-colored table lamps, and a blackboard on which are advertised the day's specials so that you can choose your tender morsels while you wait. Chef Keller's French Laundry cookbook graces the waiting area, as do several small pastries. You might want to take a look at the menu while you wait, as it changes seasonally; the more often you dine here, the more dishes you'll get to try. To the left is a hallway that houses two private dining rooms; one seats 14 people and the other up to 40. Both have a food and beverage minimum ($1,400 and $4,000, plus tax and service charge, respectively). The rooms are enclosed, and music is piped into them from outside.